It feels good to have something green and growing within our immediate living space. It could be considered a natural extension of our original existence in the lap of nature. While we demarcate the exteriors and the interiors with impermeable walls, bringing a few plants indoors can make all the difference. We already knew from experience that indoor plants lift up our spirits and make us less prone to headaches, mood swings and even allergies. But it took certain experiments by NASA in controlled conditions to tell us exactly why. They tested a number of common houseplants against indoor air pollutants, particularly ammonia and volatile organic compounds (VOCs) like formaldehyde, trichloroethylene, benzene, toluene, and xylene. High levels of VOCs in the indoor air result in several health problems, collectively called ‘sick building syndrome’. Some of them, like benzene, are known carcinogens. Benzene plays a major role in the carcinogenic effect of tobacco smoke. This chemical leaches into the air from plastics, synthetic fibers and resins in the house and cause nausea, vomiting, and dizziness. Formaldehyde emitted by paints and varnishes and the adhesives used in wall boards can irritate the respiratory tract and cause allergies. Many of the plants tested absorbed at least one or two of the toxic compounds while a few showed the capacity to mop up several of them, if not all. Surprisingly, the best performers are also easy-care plants that are readily available. Peace lily tops the list of plants NASA recommends for cleaning the indoor air. The scientists have found that this popular houseplant can reduce the levels of all the five indoor air pollutants tested. Spathiphyllum, with its tuft of shiny, slightly ruffled leaves and white flowers held high above the foliage is one of the few houseplants that bloom reliably even in low light conditions. But it will reward you with continuous flowering if given ample light. The thick growth of dark green leaves shows off the pristine white flowers to great advantage. The large, white, petal-like portion is a modified leaf called spathe that protects the creamy white, spiky inflorescence. It turns green as it ages. But removing older spathes promotes flowering. This flowering plant, better known as garden mums or florist’s chrysanthemum is a favorite with almost every gardener. The flowers come in several colors and shapes, but they are floriferous only when grown outdoors in full sun. But they make the list on the strength of their ability to improve indoor air quality. They are at par with peace lily in this regard, removing ammonia as well as all the five toxic VOCs tested. English ivy has a long history of being used as a houseplant, but it has fallen out of favor of late because of its current status as an invasive weed in most parts of the country. Their beautiful leaves and trailing branches can be better enjoyed indoors, with no fear of the plants taking over the landscape. They are so versatile that you can use them in different ways to enhance your décor. Grow them in hanging pots or trained on trellises. English ivy likes rich soil with a fair amount of organic matter that helps retain moisture. They need bright light to do well, especially the variegated varieties. Prune them whenever necessary, using the cut branches in flower arrangements or to start new plants. Have as many plants as you can find place for; they mop up the VOC from the indoor air, making it healthier for you. Just avoid throwing them into compost bins or anywhere outdoors where they can be a problem. This tough plant is nearly indestructible, its only weak spot being overwatering. You can relegate it to the darkest corner in the attic or basement, but it will survive there for a very long time, unattended and uncared for. However, surviving is not the same as thriving. Give them bright sunlight and regular watering, and they glow with bright variegation and healthy growth. Sansevieria plants send out new leaves from the creeping rhizomes that remain underground, usually just below the top layer of soil. A loose soil structure helps the plant to spread faster and fill out the pots quickly. No feeding is necessary, but you can use a general fertilizer once or twice a year. They are free of pests and diseases, and the vertical orientation of leaves avoids dust collection. Commonly called dragon tree plants, these are cane-forming plants with a tuft of leaves at the tip of branches. Of the several species and cultivars of dracaenas available, the red-edged dracaena (Dracaena marginata) seems to have come out the winner in NASA experiments, but the other three varieties are not far behind in offering health benefits. Dracaenas are tough plants that will put up with a lot of neglect, but they will stretch and grow up to the ceiling with the slightest care. Water young plants frequently, but older plants are drought tolerant. Keep the plants under control by pruning the canes whenever necessary. Some people love the architectural shapes they assume as they grow tall with leafless stalks except for the terminal tuft. Others prefer a bushy plant. Pruning promotes branching and a much thicker tuft of leaves. If one grows too lanky, you can take a stem cutting to start a new plant. These flowering plants are known for their beautiful flowers in vibrant colors. Often used as cut flowers, they last in vases for several days. They look equally good on the plants, each one consisting of a rosette of downy, radish-like leaves, with the flowers arising from the middle of the rosette. Gerbera daisies are usually grown as annuals outdoors except in USDA zones 9 and above. When grown indoors, you can keep them as perennials for 2-3 years, but if you expect to get flowers, provide very bright light. An east-facing window is best because too much afternoon sun can scorch the leaves of plants kept indoors. This plant gets its common name from its vigorous growth habit in their native habitat in the tropical rainforests of South America. These fast climbers are known to overwhelm all the trees in their vicinity by climbing to their crowns and blocking sunlight and sending down long, whip-like secondary roots to ensure firm attachment. However, there’s no danger of that happening when they are grown indoors in containers. In fact, that is the only safe way to grow them in warmer areas. It is a fan palm with leaves divided all the way, making it look like a hybrid of palmate and pinnate palms. The growth habit is clumping and cane-forming. You usually get a bushy specimen with slender canes of different heights than a single tall plant as the years go by. Yes, these house plants are long living, and it is worth spending extra on one or two good-sized plants. And they do not like to be disturbed, so it makes sense to start them off in a large pot or tub. Spider plants are a favorite with children and a common fixture in many schoolrooms. That tells you how easy it is to grow them. They are usually grown in hanging planters to give space for the leaves to spread, but keeping them on a pedestal or a shelf can be just as effective. The grass-like variegated foliage can brighten up any dull corner in your home. If anything can be more interesting than the gracefully arching leaves, it is the flower stalks that shoot up from amidst the leaves. These eventually get weighed down by tiny plantlets that develop at their tips. These plantlets grow roots and get established as soon as they come in contact with soil, but that doesn’t happen with potted plants. There’s no hard and fast rule about the placement of houseplants, but they do their best when each plant is given an environment closest to its ideal growing environment regarding temperature, humidity, and light. 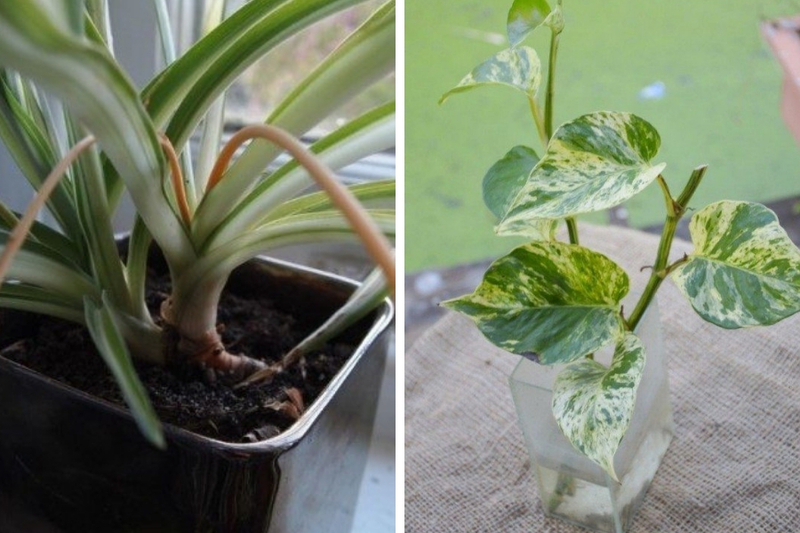 Like plants growing outside in the garden, houseplants love company. You can group those with similar cultural requirements together in larger containers to form pleasing arrangements. Soil microbes in the pots do have a role in keeping the indoor air clean and healthy, but some people may develop allergies. Soil molds could be the main culprits. They can be controlled by limiting water and allowing good drainage and air circulation. Growing the houseplants in soilless media, or hydroponically, is another option. So, if you are looking for a healthy addition to your home, consider one of these beautiful and low-maintenance, NASA approved houseplants and enjoy cleaner air and a more vibrant home. eco-friendly, creatively frugal gardening tutorials, remedies & tips.